For the Russian sect, see Filippians. "Philippians" redirects here. It is not to be confused with Philippines. The Epistle of Paul and Timothy to the Philippians, often referred to simply as Philippians, is the eleventh book in the New Testament. Paul and Timothy first visited Philippi in Greece during Paul's second missionary journey, which occurred between approximately 49 and 51 AD. Philippi was the location of the first Christian community established in Europe. 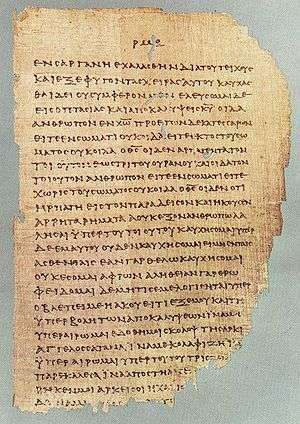 Biblical scholars are in general agreement that the letter was indeed written by Paul of Tarsus. The estimated date of the letter is 62 AD, about 10 years after Paul's first visit to Philippi. The historical background of Philippians is traditionally gathered from two main primary New Testament sources: informative internal data from the letter itself, and related information garnered from the rest of the New Testament Canon, especially from the Acts of the Apostles and the other Pauline Epistles. Other primary information is also derived from external historical sources related to the chronological connections between Paul's association with Philippi, its political and economical setting, and its social and religio-philosophical context. According to the document itself, the Philippians had sent Epaphroditus, their envoy ("messenger [apostolon] and minister [leitourgon]" Phil 2:25), with contributions as an expression of their "partnership" and "concern" to meet the needs of Paul (Phil 1:3–5, Phil 2:30, and Phil 4:10–19). During the execution of his responsibilities of travel to deliver their "gift" (Phil 4:17), Epaphroditus contracted some life-threatening debilitating illness (esthenese, cf. Phil 2:26–27). At some point he recovers. It is at this time, whether premeditated or due to an extended stay with the apostle, various internal matters are revealed to Paul on the part of Epaphroditus (Phil 1:27–30, Phil 2:19–24, Phil 3:2–3, Phil 3:17–20, Phil 4:2–3, and Phil 4:9). Upon Epaphroditus' return to health, Paul sends word to the Philippians through Epaphroditus of his upcoming sentence in Rome and of his optimism in the face of death (1:18b-26), along with exhortations to imitate his capacity to rejoice in the Lord despite one's circumstances (2:14–18). Moreover, Paul sends counsel regarding spiritual adversaries among the Philippians (3:1–21), and conflicts within their fellowship (4:2–3). Lastly, he provides receipt of both Epaphroditus' heroism (2:25–30) and the arrival of "the gift" (4:10), along with his promise of a divine accounting (4:17–20). Within the letter is also found an optimism where Paul's belief of his release is the basis upon which he promises to send Timothy to them for ministry (3:19–23), and an anticipation to also pay them a personal visit (2:24). With this communication Epaphroditus sets out on his homeward journey (2:28–29). A similar disappointment with co-workers shared only with 2 Timothy. The letter begins in standard form for an ancient Hellenistic letter structure, with author – or senders – first, then recipients with a greeting (Phil. 1.1–2). It is possible that the kenosis passage in Philippians 2:5–11 may have been a Christian hymn that Paul quoted. The letter was written to the church at Philippi, one of the earliest churches to be founded in Europe. They were very attached to Paul, just as he was very fond of them. Of all the churches, their contributions (which Paul gratefully acknowledges) are among the only ones he accepts. (Acts 20:33–35; 2 Cor. 11:7–12; 2 Thess. 3:8). The generosity of the Philippians comes out very conspicuously (Phil. 4:15). "This was a characteristic of the Macedonian missions, as 2 Cor. 8 and 9 amply and beautifully prove. It is remarkable that the Macedonian converts were, as a class, very poor (2 Cor. 8:2), though the very first converts were of all classes (Acts 16); and the parallel facts, their poverty and their open-handed support of the great missionary and his work, are deeply harmonious." (Moule). As with all epistles, the original was composed in Greek. Philippians has been the subject of much research and Ralph P. Martin argues that Philippians 2 may be considered the beginning of the field of Christology, specifically referring to the rich analysis that Apostle Paul began in Philippians 2:5–6. Veronica Koperski views Philippians 3:10 as the beginning of the analysis of the knowledge of Christ. While Paul's opening prayer is for love (1:9), based on knowledge of Christ, his final prayer is for the peace of God (4:7), which surpasses all understanding. Thus the concepts of love, knowledge and peace are jointly developed in the Epistle. ↑ Frederick F. Bruce, 1989, Philippians, NIBC, NT Series, edited by W. Ward Gasque (Peabody, Mass. : Hendrickson), 4. ↑ Wayne Jackson, 1987, The Book of Philippians: A Grammatical and Practical Study (Abilene, Tex. : Quality Publications), 13–17. ↑ Clement of Rome (late 1st century) makes a reference to the ministry of Paul after the end of Acts. Clement, To the Corinthians, 5. In J. B. Lightfoot (ed), The Apostolic Fathers (Michigan: Baker Book House, 1978) 15. The author of the Muratorian Canon (late 2nd century) says that Luke recorded mostly that which he himself witnessed and therefore that is why he did not include ‘the journey of Paul, when he went from the city - Rome - to Spain.’ The Muratoriun Canon. 2. The apocryphal Acts of Peter makes reference to the tradition that Paul reached Spain. Paul is described in prison in Rome, receiving a vision from God that he would go to Spain. Acts of Peter, Verscelli Acts 1 and 3. Eusebius (early 300’s) recorded that Paul did more ministry after his first jail time in Rome. Eusebius, Ecclesiastical History, II, 22, 1-8, in Philip Schaff and Henry Wace (editors), A Select Library of Nicene and Post-Nicene Fathers of the Christian Church 2nd series. Vol.1. Eusebius: Church History, Life of Constantine the Great, and Oration in Praise of Constantine (Edinburgh: Eerdmans, 1997) 124-125. ↑ Ronald Russell, 1982, "Pauline Letter Structure in Philippians," Journal of the Evangelical Theological Society 25.3 (Sept.): 297-98. ↑ "11. Philippians: Introduction, Argument, and Outline". Bible.org. ↑ Philippians 2:5–11: Scripture taken from the New American Standard Bible, Copyright © 1960,1962,1963,1968,1971,1972,1973,1975,1977,1995 by The Lockman Foundation. Used by permission. ↑ SECTION X. TESTIMONIES TO THE CANONICAL AUTHORITY OF THE FOURTEEN EPISTLES OF PAUL. Canon of the Old and New Testaments Ascertained, or The Bible Complete without the Apocrypha and Unwritten Traditions. Alexander, Archibald (1772–1851). Abrahamsen, Valerie (March 1988). "Christianity and the Rock Reliefs at Philippi". Biblical Archaeologist. 51 (1): 46–56. doi:10.2307/3210038. Barclay, William. 1975. The Letters to the Philippians, Colossians, and Thessalonians. Rev. ed. Daily Bible Study Series. Louisville, Ky.: Westminster. Barnes, Albert. 1949. Ephesians, Philippians, and Colossians. Enlarged type edition. Edited by Robert Frew. Grand Rapids, Mich.: Baker. Blevins, James L. 1980. "Introduction to Philippians." Review and Expositor 77 (Sum. ): 311-25. Brooks, James A. 1980. “Introduction to Philippians.” Southwestern Journal of Theology 23.1 (Fall): 7–54. Bruce, Frederick F. 1989. Philippians. New International Biblical Commentary. New Testament Series. Edited by W. Ward Gasque. Peabody, Mass. : Hendrickson, 2002. Burton, Ernest De Witt. 1896. “The Epistles of the Imprisonment.” Biblical World 7.1: 46–56. Elkins, Garland. 1976. “The Living Message of Philippians.” Pages 171–80 in The Living Messages of the Books of the New Testament. Edited by Garland Elkins and Thomas B. Warren. Jonesboro, Ark. : National Christian. Garland, David E. 1985. “The Composition and Unity of Philippians: Some Neglected Literary Factors.” Novum Testamentum 27.2 (April): 141-73. Hagelberg, Dave. 2007. Philippians: An Ancient Thank You Letter – A Study of Paul and His Ministry Partners’ Relationship. English ed. Metro Manila: Philippine Challenge. Hawthorne, Gerald F. 1983. Philippians. Word Biblical Commentary 43. Edited by Bruce Metzger. Nashville, Tenn.: Nelson. Herrick, Greg. “Introduction, Background, and Outline to Philippians.” Bible.org. Jackson, Wayne. 1987. The Book of Philippians: A Grammatical and Practical Study. Abilene, Tex. : Quality. Kennedy, H. A. A. 1900. “The Epistle to the Philippians.” Expositor’s Greek Testament. Vol. 3. Edited by W. Robertson Nicoll. New York, NY: Doran. Lenski, Richard C. H. 1937. The Interpretation of St. Paul’s Epistles to the Galatians, to the Ephesians, and to the Philippians. Repr. Peabody, Mass. : Hendrickson, 2001. Lipscomb, David and J.W. Shepherd. 1968. Ephesians, Philippians, and Colossians. Rev. ed. Edited by J.W. Shepherd. Gospel Advocated Commentary. Nashville, Tenn.: Gospel Advocate. Llewelyn, Stephen R. 1995. “Sending Letters in the Ancient World: Paul and the Philippians.” Tyndale Bulletin 46.2: 337–56. Mackay, B. S. 1961. “Further Thoughts on Philippians.” New Testament Studies 7.2 (Jan.): 161-70. Martin, Ralph P. 1959. The Epistle of Paul to the Philippians. Tyndale New Testament Commentaries. Ed. By R.V.G. Tasker. Grand Rapids, Mich.: Eerdmans, 1977. Martin, Ralph P. 1976. Philippians. New Century Bible Commentary. New Testament. Edited by Matthew Black. Repr. Grand Rapids, Mich.: Eerdmans. Mule, D. S. M. (1981). The Letter to the Philippians. Cook Book House. Müller, Jacobus J. 1955. The Epistle of Paul to the Philippians. New International Commentary on the New Testament. Ed. By Frederick F. Bruce. Grand Rapids, Mich.: Eerdmans, 1991. Pelaez, I. N. (1970). A Epistle on the Philippians. Angel & Water;reprint, Angels new books, ed. Michael Angelo. (1987). Peabody, MA: Hendrickson. Dictionary of Paul and His Letters, s.v. "Philippians, Letter to the"
Reicke, Bo. 1970. “Caesarea, Rome, and the Captivity Epistles.” Pages 277–86 in Apostolic History and the Gospel: Biblical and Historical Essays Presented to F. F. Bruce. Edited by W. Ward Gasque and Ralph P. Martin. Exeter: Paternoster Press. Roper, David. 2003. “Philippians: Rejoicing in Christ.” BibleCourses.com. Accessed: 3 Sept. 2011. Russell, Ronald. 1982. "Pauline Letter Structure in Philippians." Journal of the Evangelical Theological Society 25.3 (Sept.): 295–306. Sanders, Ed. 1987. “Philippians.” Pages 331–39 in New Testament Survey. Edited by Don Shackelford. Searcy, Ark. : Harding University. Sergio Rosell Nebreda, Christ Identity: A Social-Scientific Reading of Philippians 2.5–11 (Göttingen, Vandenhoeck & Ruprecht, 2011) (Forschungen zur Religion und Literatur des Alten und Neuen Testaments, 240). Swift, Robert C. 1984. "The Theme and Structure of Philippians." Bibliotheca Sacra 141 (July): 234-54. Synge, F.C. 1951. Philippians and Colossians. Torch Bible Commentaries. Edited by John Marsh, David M. Paton, and Alan Richardson. London: SCM, 1958. Thielman, Frank. 1995. Philippians. NIV Application Commentary. General Editor. Terry Muck. Grand Rapids, Mich.: Zondervan. Vincent, Marvin R. 1897. The Epistle to the Philippians and to Philemon. International Critical Commentary. Ed. By Samuel R. Driver, Alfred Plummer, Charles A. Briggs. Edinburgh: Clark, 1902. Vincent, Marvin R. Vincent’s Word Studies in the New Testament. 4 vols. Peabody, Mass. : Hendrickson, n.d.
Wallace, Daniel B. “Philippians: Introductions, Argument, and Outline.” Bible.org. Walvoord, John F. 1971. Philippians: Triumph in Christ. Everyman’s Bible Commentary. Chicago, Ill.: Moody. Herbermann, Charles, ed. (1913). "Epistle to the Philippians". Catholic Encyclopedia. New York: Robert Appleton Company.